While I and others have no doubt blown it out of proportion, NPR’s recent decision to not promote its podcasts in its radio newsmagazines has a lot of people talking about whether local stations are keeping NPR from embracing a digital-first future. Organizations in large, wealthy communities effectively subsidize organizations in small, poor communities. I can’t imagine a digital-first NPR doing any of that without its stations. So on this week’s episode of The Pub, I’m asking three of the smartest station leaders I know: How do you envision NPR and stations maintaining a mutually beneficial coexistence as the primacy of radio fades? Do stations grant NPR more autonomy in exchange for lower programming fees? Do they allow aspects of fundraising to be nationally centralized? Do they relinquish their signals and reorganize themselves to be local content mills for NPR One? 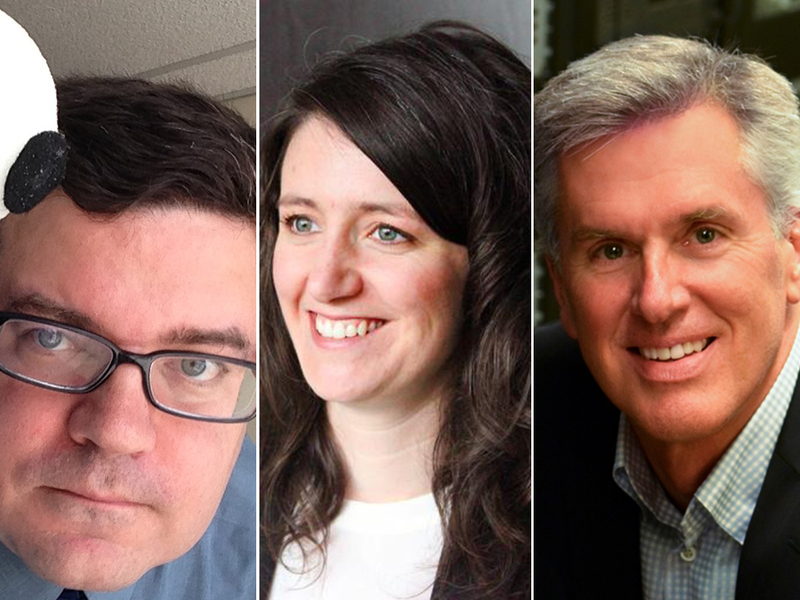 We talk about all of that and more with West Virginia Public Broadcasting CEO Scott Finn, WAMU content chief Andi McDaniel and Southern California Public Radio CEO Bill Davis. A wide-ranging discussion of podcasting from the Society for Cinema and Media Studies conference in Atlanta. Is it still Public Radio if the revenue is derived solely from ad revenue? I would say no, but is that actually happening? I don’t know what the breakdown of public versus private support is for podcasts typically associated with public media, but it may be worth exploration. Ira’s comments at SXSW lead one to assume that ad money is going to be paying for the development of new content. How will the public know the difference between programs supported through underwriting versus ads? If, as Mr. Finn points out, that .orgs have to determine how they will monetize podcasts and digital content, how do we communicate the public-private sponsorship most effectively? Given the growth of for-profit content providers populated by former public radio producers, the aural landscape for the listener is becoming gloriously rich, but also muddies the water when it comes to the listener determining what responsibility they have for funding the content. If as a listener I hear a sponsorship message on a podcast, but no additional credit/solicitation for listener support, my assumption is that the sponsor is paying for the production of the content. I don’t know, I think the line between underwriting and advertising is already so blurry, I doubt the audience notices or cares that much. I personally don’t believe it is a substantive distinction. And I don’t need a member solicitation in every program to know that the programming is member-supported. Regardless, I would argue that the defining characteristic of public media is the involvement of taxpayer dollars, not member dollars. Since the TAL organization spun off from WBEZ last year, I think it’s a legitimate question whether Ira and Co. are still in the public media business. I suppose you could argue that because TAL itself still airs on taxpayer-funded public radio stations, it is indirectly supported by taxpayer dollars. But Serial? I can’t think of any way that taxpayer money is involved in Serial. In my book, that means it’s not public media. It’s not even nonprofit media, because the TAL organization is a “public-benefit corporation,” which is a type of for-profit. So, what does that mean for the future of digital public media? Corporate funding is plentiful now, but it is capricious (I know because I worked in commercial radio for 18 years and lived through the ups and downs) and the strength of public media a diversified funding portfolio. At some point, giving one’s ears over to Scion for 15 seconds isn’t going to pay the bills. The most reliable funding for this kind of content has always come directly from listeners—and yet millions of TAL and Serial listeners are coming to know these programs through an ad-supported channel. Of course, we are seeing for-profit media organizations that sound like public media enjoy success, but it’s the most expensive radio to produce. At some point competing for the advertising pie is going to become fierce and it will be necessary to diversify funding sources. Also, it won’t be long before the now-dispersed world of digital content production consolidates into the hands of a small number of media organizations that are better suited to distribute and promote that content. And if that content stays “free” for the listening for the next generations of Digital Audio Content Natives, that will be an interesting challenge for local public radio stations. The line is blurry only until you listen to a commercial radio station for about an hour. Then it starts getting pretty damn clear! I think regular pubradio listeners are “spoiled” in that they forget how intrusive and omnipresent 20 minutes of ads every hour can really be. I’m sure for quite a lot of them, the old pledge drive argument of “we don’t air ads” is gradually (if not rapidly) falling on deaf ears because those listeners have gotten used to underwriting, and they feel (not incorrectly) that sponsorship is sponsorship. And yes, if there were a commercial radio station out there that throttled it back so that the ads were shorter (say, 30 seconds each), and totalled perhaps 5-10 minutes per hour, and weren’t all SCREAMING CAR ADS or whatever? That station would indeed be difficult to distinguish from your average pubradio station. Nah, I think the podcasting industry (both public and for-profit) has learned well from commercial radio’s mistakes, and people are working really hard to make advertising that’s listenable. It benefits the content creator, the audience AND the advertiser to steer way clear of “1-877-KARS4KIDZ!!! !” territory. Oh I see. Yeah I hadn’t really thought of it from that angle…now I get what you’re saying. I think you’re right but I also think that’s a product of plenty. Plenty of idealism, and for the moment, plenty of funding. That’s in no small part because podcasting is still shiny-n-new and the medium is still part of the message. Eventually that’ll fade as the medium becomes much more ubiquitous (it’s nowhere near that yet). Once it does, you’ll see less scrupulous content creators move into the space who’re just about hustling for a buck. And the screaming car ads will creep in. It’s a lot like the early days of the internet. Reputable sites were picky about who they allowed to have banner ads on their site. Nowadays, with a few exceptions, you’ll see outright frauds sponsoring pretty major sites. Look at all the goldbugs and miracle cancer cures you see on a lot of “extreme” political news sites. The good news is that what matters is still the content creator themselves. If they come from a non-profit business model, then they know that building a healthy, long-term relationship with the consumer is top priority…rather than the for-profit model of selling that relationship to the highest bidder. So I would anticipate public media’s continued success in this arena. Are there people working at NPR who aren’t Ivy Leaguers with a trust fund?